Millennials' favorite song, "Mr. Brightside," was already a shimmering gem, but it gets a wonderful new take when re-imagined in the Star Wars prequel universe. If you want to sing along with the video linked above, we won't even be mad. Finally, We Know The Lyrics! Twitter user Mike Recine started a fun trend when he texted his girlfriend a "poem" that was actually the lyrics to the King of Queens theme song. She bought it, and responded with a flourish of heart eyed emojis. Since tweeting about his experience, other Twitter users have been trying the prank on for size - to mixed results! One Way to Spice Up Your Relationship is to Text Prank Them With Drake Lyrics, What Could Go Wrong? You know the lyrics: "Whoa, we're halfway there. Whoa-oH LIVING ON A PRAYER"
It turns out this setup is ripe for punning, so take my hand and we'll make it through this list of meme based puns. Wait, These are the Official Lyrics to the Super Mario Bros Theme Song? Prank of The Day: What Happens When You Text Adele Lyrics to Your Ex? Adele released her new single "Hello" last week to much acclaim. And unless you've been living under a rock, you've wept alone to this tune at least 15 times. This guy is apparently living under a rock. 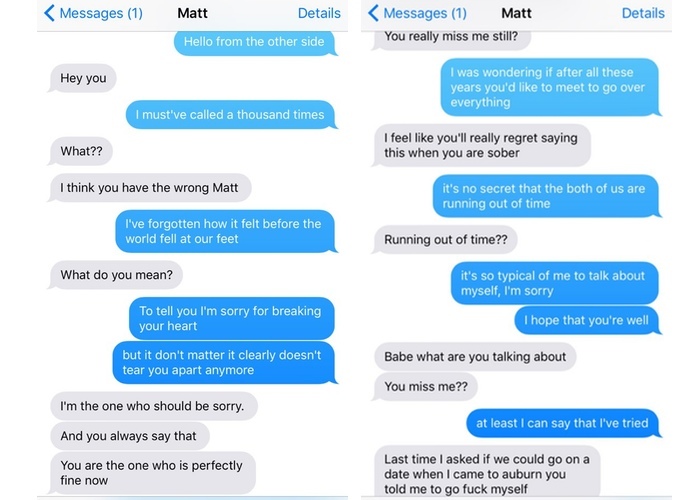 Mary Caldarella decided to text her ex-boyfriend, Matt, these heartbreaking lyrics to see how'd he react. "Last time I asked if we could go on a date when I came to auburn you told me to go f*ck myself."